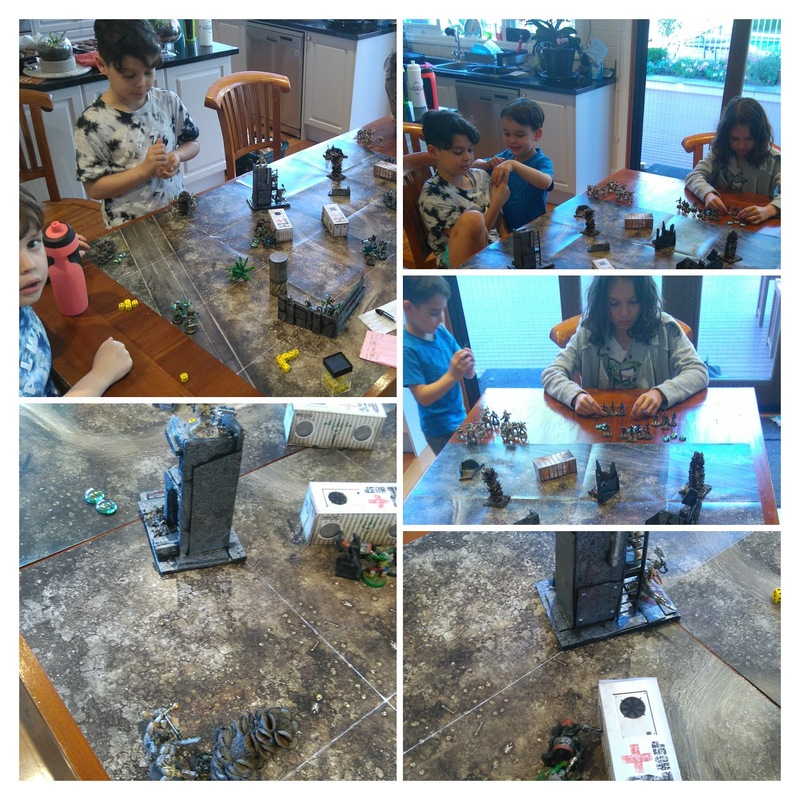 On the weekend we had a quick 4-sided/way game of The Battlefield: Miniature Modern Warfare with Harriet using the Dark Eldar, Paddy with the Chaos Space Marines, Alex using Orks and Charlie and I leading the Necrons. We played a slight variation of the Death Match Game Mode (pg 39 of the rules) which is pretty straight-forward: normally points are awarded for enemy 'kills' and the first team to score 25 points wins. In the interest of time - we had less than an hour before dinner to setup, play and pack everything away - we played to 15 points, limited the number of Units to a max of 3 per Team and made them default Assault (with Bipod) and stuck with 9 CAP per player per turn - nothing too difficult. The game played fast and furious with Alex's aggressive attack on both the Necrons and Chaos Marines racking up a few points but then he went too deep and was cut down in crossfire between the two forces. Paddy's attack rolls were amazing (Crown Casino watch out) regularly achieving multiple successes thanks to exploding 6's. Harriet was a lot more conservative than her brothers, hugging terrain and focusing on Paddy's units, one-at-a-time. Whilst I must admit, I prefer the manner in which Rogue Planet keeps all players continually immersed/invested in the game (through the Counteraction mechanism), The Battlefield has lots of features that makes for an exciting game. The manner in which cover is resolved, occupation of terrain and spotting works very nicely. And Spawning: the kids love the fact that they can respawn their downed units and rejoin the battle. That coupled with the opposed combat die rolls kept their attention. That card, coupled with providing the active player with 9 CAP tokens/stones/gems made for relatively quick rounds - I think I only had to reference the rulebook twice during the whole game. Big Tick. Often the Card would be snatched out of my hand so that they (not I) could work out their sequence of Actions in their head (tactical planning and some mental arithmetic ✅) without letting onto their opponents what they were considering. It made an old man smile. PS we also used the Card's side as the standard Unit's Movement - no need for tape measures and rulers people! Actually, when preparing for the game, I reviewed the rules and realised that I'd misunderstood - previously I was calculating CAP cost using Base to the power of the Action, not a multiple of the Action e.g., a third Shooting Action should cost 6 CAP (2 Base x 3rd Action), but I was applying a cost of 8 CAP (2 Base ^ 3rd Action)*. 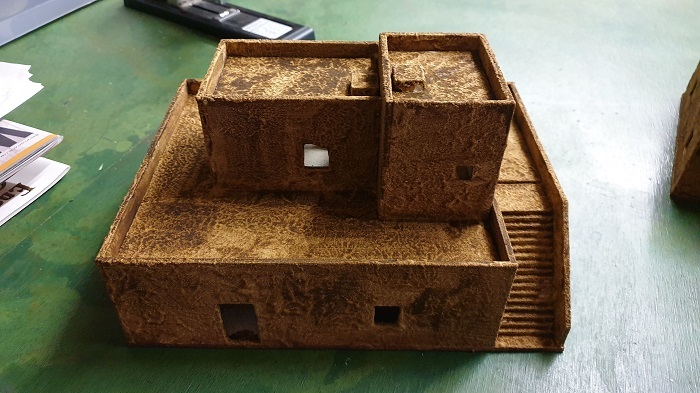 *Funnily enough it actually worked and REALLY forced one to think hard whether and how far to put a Unit into Overdrive... might be worth testing again in the future... maybe a mechanism that could account for troop quality? ?